Kevin Powell, who interviewed the late hip-hop superstar several times for Vibe magazine before he was killed in a drive-by shooting in 1996, claims plot elements were lifted from his interviews. 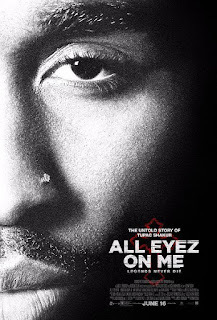 "After a great deal of thought and consultation with many, including my attorneys, I have filed a federal lawsuit against the producers and writers of All Eyez On Me, the new Tupac Shakur biopic, for copyright infringement," he wrote in a statement posted on Facebook on Friday (June 23). "After viewing the movie twice in the past few days, it is clear that my exclusive Vibe cover stories on Tupac Shakur (when he was alive), were lifted, without proper credit or compensation of any kind to me, and used in All Eyez On Me." Powell is suing bosses at the film's studio Lionsgate, as well as those with production and writing credits on the new film. In his complaint, posted online by editors at The Hollywood Reporter, Powell's lawyer states that a character in the movie, Nigel, was never a real person but a character invented for his articles. "This made-up character of Nigel was the embellishment of a real-life character that was central to the narrative in Plaintiff's articles," the complaint reads. "This made-up character was copied and pasted into Defendant's film to play the same central character and role in the Infringing Work as he did in the Original Work." Powell, who plans to publish a biography of the legendary rapper next year, notably interviewed Shakur in 1995 while he was incarcerated in New York's notorious Rikers Island prison on sexual assault charges. The hip-hop star died aged just 25 in September 1996 after being shot multiple times while out in Las Vegas, Nevada. Since opening in U.S. cinemas earlier this month, the film, which stars Demetrius Shipp Jr. as Shakur and is directed by Benny Boom, has attracted controversy and scathing reviews. Jada Pinkett Smith, the actress who knew Tupac as a teenager, slammed her portrayal in the movie, and the film's depiction of her relationship with the rapper as "deeply hurtful".